Top Finish on Magic Dice Today! I Landed 11th Place and 75,000 Magic. When I First Learned About @MagicDice I Knew It Was Smart to Play Often and Grab Those Magic Tokens. My goal with @MagicDice is to earn 1 Million Magic to maximize my dividend earnings. Why not be part of the house? Magic Dice has rewarded your post with a 20% upvote. Thanks for playing Magic Dice. Nice bonus there! I would like to get up to 1 million tokens too. Sitting around 200k right now, but haven't had time to play much lately. Think that is a good goal to reach. Oh No! Got to get back on the winning side. It sure is addicting. I get on losing streaks as well and it can get frustrating. Well, dam I need to step it up! Wow man!! how much did you invest on each spin? Max 40 but that is with a 35% chance of winning. It works great until I lose 5 or 6 times in a row. Have you checked your dividends? I play higher amounts with less of an opportunity to win. So when I win it is big. Usually 25%-30% chance of winning is my percentage of choice. Congrats. I am split between playing more or just keep earning dividends on my 200 K magic tokens. What's your opinion? Does it make sense to push for million tokens? This is a gamble for me. If @MagicDice turns into a very popular gaming system on Steem then the dividends could be substantial in the future. If they don't do anything I still had fun playing. Hmm. Fair enough assessment. Have fun, buddy! ITs a great way to earn dividends, I have played for a while and I’m just about even if I convert my Steem dollar profits to Steem it would wash out as even. I have earned just over 2 Million Tokens! Holy crap, yes you have been playing a lot. Below you will see the live current stats ! It is possible to succeed! No man this is not a lot there are a few guys who must have most of the tokens . 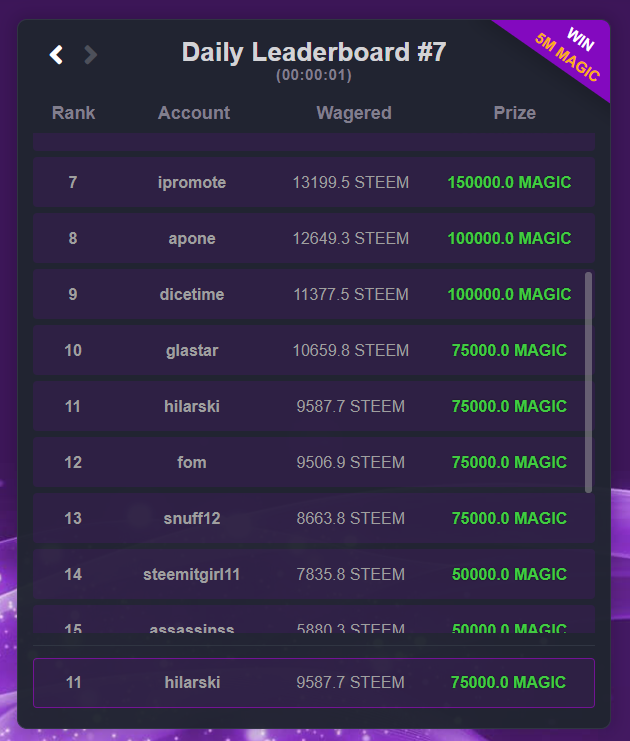 There are a few that were playing 200,000 Steem in one day when the payout was 50 per Steem that was 10 million magic tokens. I’m just a drop in the bucket lol. I can only do it because I been winning . If not I would have been out along time ago . So did you make it to 1mil @magicdice tokens? Good day. thanks for sharing this post I appreciate your valuable post.. Your UA account score is currently 6.808 which ranks you at #113 across all Steem accounts. In our last Algorithmic Curation Round, consisting of 211 contributions, your post is ranked at #7.